Thanks to its proximity to the mainland, Mykonos was one of the first Greek islands to become an international travel destination. During the late '60s and early '70s, Mykonos was famed as a haunt for the rich. The island's nightlife - then and now - was a glittering whirl of colored lights, music, and parties. But there's another side to Mykonos - the neighboring island of Delos. In classical mythology, Delos was the birthplace of Apollo and his twin sister Artemis. Travelers to Delos can stroll among the island's vast ruins, which include three temples consecrated to the Sun God and the famed Lions Walk. Mykonos town features hip boutiques, restaurants, jewelry stores, souvenirs, taverns and cafés. The island's famed windmills are found just south of the waterfront. Despite its small size, Delos, the birthplace of Artemis and Apollo, is one of the main Archaeological sites in Greece. These sacred grounds reveal temples and sanctuaries within their marble ruins. Situated under the Byzantine Monastery of St. John, charming, whitewashed homes and blue-domed churches are built into the hillside, and narrow, windy streets reveal shops and tavernas at every turn. Photographed by millions of visitors, these houses are built along the seaside and offer a sweeping view of the Aegean. 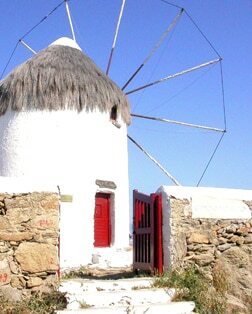 The island's famous windmills occupy the high ground. The name of the island's most famous church also gives its location: outside the city walls. Paraportiani is considered a prime example of Cycladic architecture. The quintessential image of a Greek Island getaway, the beaches of Mykonos are known for their crystalline waters, long stretches of golden sand, stunning views, and an abundance of water sports. Founded in 1542, this church is renowned for its unique architecture and whitewashed exterior. Inside, hand-carved altar screens are displayed. A small museum includes holy icons and the original monastery bells. Housed in a traditional 19th Century Mykonian building, this collection of Greek nautical artifacts celebrates the history and legacy of merchant ships that sailed the Aegean Sea. A showcase for the abundant finds from the excavations Delos, this museum, built in 1904, displays exquisite artifacts and marble sculpture from the early Archaic period through Roman Imperial times.